The Magic Millions January Sales and Raceday Carnival is a week-long celebration of equine sports. Magic Millions is the largest thoroughbred auction house in the Southern Hemisphere and is host to Australia’s first $10 Million raceday. The next jewel to be added to the Magic Millions Carnival crown was clear. Polo. The popularity of Polo both from within Australia and internationally, coupled with Magic Millions’ reputation for event excellence has already seen Queensland’s pre-eminent luxury shopping destination, Pacific Fair sign on as the naming rights partner for Magic Millions Polo. The style, design and calibre of play will ensure the 2017 Pacific Fair Magic Millions Polo Tournament will become an internationally and nationally renowned event.Magic Millions co-owner Katie Page-Harvey commented, “Polo is the only other sport that is referred to as the Sport of Kings, but as with everything Magic Millions – Magic Millions Polo will be designed to capture the attention of everyone; newcomers to the sport, families and those who love live action sport, as well as the Polo & equestrian devotee. “We are just so excited about every aspect of Magic Millions Polo. The Polo playing talent will showcase some of the best in the world; Nic and Alejandro, Rob and Jack teaming up with Zara and Francesca. It will be the most incredible spectacle. Add to this our first Polo game of the day made up of the future Australian 2017 World Cup team. These players are just the best. “For our Ambassadors, our guests and all our visitors, as soon as we say our event will be held on Queensland’s Gold Coast, they say yes. What could be better than a day of top Polo action, set on the Gold Coast’s stunning Spit overlooking the Broadwater to the north and Main Beach to the east. Magic Millions will deliver a tiered hospitality offering so everyone can find an entertainment combination that suits them. The affordable, general admission ticketing and hospitality will attract families from local, inter and intra-state keen to enjoy a full day of live sporting entertainment in a safe, self-contained and visually appealing setting. The facilities will include picnic food and beverage options – perfect for all ages. The VIP sit-down and standing room ticketed marquees will appeal to those who want a more luxurious Polo event experience. Both Polo games will be commentated by Channel Seven Sports Broadcaster and Magic Millions Sales and Carnival Ambassador, Hamish McLachlan. Hamish’s expertise will allow newcomers to the sport to gain an understanding of the rules and objectives, as well as offering entertainment between games. Polo has a well-established following with over 50 countries involved in the game. The dominant nations are Argentina, the USA and Britain, each of which has a thriving polo scene and industry. Other polo growth hotspots include China, Dubai, Switzerland, Singapore, New Zealand, South Africa, the Caribbean, Chile, Spain and, of course, Australia. Queensland Minister for Tourism and Major Events Kate Jones said the Polo match was a strong addition to the Magic Millions Carnival. “Magic Millions has been a signature event on the Gold Coast for more than 30 years and it is fantastic to see the program adding more international flavour,” Ms Jones said. “The Magic Millions Carnival, Sales and Raceday are key features on Queensland’s major events calendar which generate a significant boost to the state’s tourism economy. Speaking post a recent win at The Jaeger-LeCoultre Gold Cup Nic Roldan said, “I’m a fourth generation polo player. It’s been my life and my passion for as long as I can remember. Alejandro Novillo Astrada added, “My grandfather started playing polo around 1930 or 1940, he got to a 5 goal handicap. My father also played as an amateur, he got to 9 goals – and then my brothers and I became professional polo players. 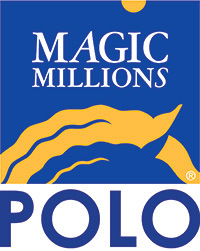 Over time Magic Millions Polo will become known as the first must-attend Polo event of the year – anywhere in the world. “The addition of a polo match during the carnival adds to the spectacle and will draw even more spectators, and guests, to our city each January. “Our City’s Sports Plan is all about attracting world class sporting events and I can’t wait to see the action,’’ he continued. Bryan Hynes, Managing Director, AMP Capital Shopping Centres said, “Pacific Fair is so proud to be the naming rights partner of Pacific Fair Magic Millions Polo. This event is a major event driving tourism and business on the Gold Coast and we are proud to be supporting Magic Millions. The Pacific Fair Magic Millions Polo Tournament will start the 2017 Carnival from Sunday 8 January, leading into the Yearling Sales, the Barrier Draw, Moet & Chandon Opening Night and the Jeep Magic Millions Raceday onSaturday 14 January.